Kinkakuji – is the most popular Zen temple in Japan. The templeâ€™s main pavilion has covering with gold leaves that shimmer in front of the pond â€“ Kyoko-chi (Mirror Pond). The temple was originally built in 1397 as a villa for the Court noble Kintsune Saionji and improved by the second owner Shogun Ashikaga Yoshimitsu. â€œRokuonjiâ€ is the former name of the temple which was the retirement villa of the shogun Ashikaga Yoshimitsu. 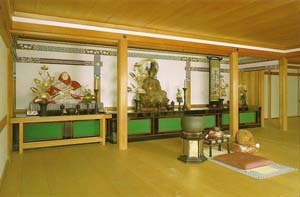 He desired to convert the place as a Zen temple. Shogun Ashikaga Yoshimitsuâ€™s son Yoshimochi fulfilled his after desire after his demise in 1408. During Onin War the great temple met more destruction. Almost all the holy places were destroyed. This golden temple is situated at the foot of the Kinugasa Hill and in the northwest of Kyoto. Devotees can make a short walk to the north from Hirano Shrine and Waratenjin Shrine. â€œWaratenjin Shrineâ€ is famous for fulfilling the prayers of safe childbirth and easy pregnancy. â€œHirano Shrineâ€ is in the Kyoto city. This temple is popular for its trees and garden. The entrance charge to Kinkakuji for adults is 400 yen and children up to junior high school 300 yen. UNESCO recognized Kinkakuji as one of the historical building of Japan and listed in World Cultural Heritage. 3-storey Kinkakuji Pavilionâ€™s upper two walls are covered with golden foil and there is bronze phoenix statue on the stone roof. This golden pavilion is located in Kyoto, the seventh largest city in Japan. In the three-storey temple, the upper two stories have a covering of gold layers. The second-floor design represents a Zen style whereas the ground floor showcases the shinden-zukuri style. The total area of the temple ground is 1, 32,000 square meters and the Kyoko-chi Pond alone occupies 60,600 square meters, includes islands of various sizes such as Nakajima and Iwa-Jima. The golden templeâ€™s reflection strikes the pond. Weather is favorable in spring (March-May) and autumn (September-November) seasons. 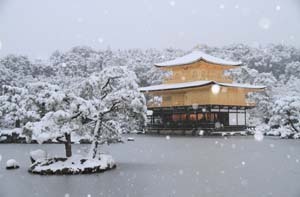 Probably these are the appropriate months to visit Kyoto. It is better to avoid June and August.Â Â A heavy rainfall and hot sun are expected in those months. Japanâ€™s vacation starts on the first week of May. So it would be a favorable time to visit all the places in Kyoto. This is the most famous Zen temple in Japan. This tiny rock garden contains 15 rocks and white gravel, a pond. The Karesansui rock garden is a national special landscape. This temple is listed under 17 world cultural heritage sites of Kyoto. Ninomaru-Goten building and one of its three gardens are primary attractions of Nijo-jo-castle. Ninomaru-Goten mansion is a national treasure. Ninomaru Teien garden possesses a history of national landscape. It comes under 17 World cultural heritage sites of Kyoto. This is a popular theater where the tourists enjoy the 7 kinds of Japanese traditional arts and entertainment in a single setting. The 7 types of entertainments are Japanese Harp, Puppet Play, Tea Ceremony, Kyoto-style Dance, Flower Arrangement, Comic Play, and Court Music. This temple is famous in Kyoto. More than 4 million people visit the place annually. Hondo is the key attraction of the temple; The main hall has been existing on a steep slope which has a stage in front of it. 139 pillars help to support the structure of the temple. The workers had not used any nail while building the temple. Honda is a national treasure. Kyoto Station Building, Kyoto Gosho, Ginkaku-Ji temple, Handy Craft Center, Heian-Jingu shrine, Sanjusangen-do temple, Arashiyama and Sagano district, To-Ji temple, Nanzen-Ji temple are the furthermore amazing visiting spots in Kyoto. The tourists can see many hotels, guest houses, star hotels in and around Kinkakuji temple. It is better to get a clear guidance before start your trip to such a traditional shrine.